I really, really would like Apple maps to be better because I value my privacy, but I have to use Google maps. I've just gone to the wrong place the wrong way through heavy traffic too many times. I should probably try Apple again, though. I believe Google Maps already has offline maps. Shortcuts helps here bc you can utilize Google Maps when you make it the default map. Thats of course when Shortcuts works....I find it to be a little buggy still. Tried it out yesterday. Visually it's not as easy to see detail/routes on the screen as Apple Maps. Also, I couldn't find a way to show the overview of the route. Did I miss it, or is it not a thing in Google Maps? An aside. So many apps are broken in CarPlay with iOS 12 now. Including the stock Apple Podcasts app. SirusXM's app, which was marginal to use before, is completely broken. Overcast just had a big update, with zero attention to the CarPlay interface, which is useless, and remains useless. i'll wait for waze, Google maps still have a fundamental issue how it locate an address. If a place sits off the road (where the address is located) by a fairly good distance and there is another road close to the physical location, google will take you to that road since it using the physical locations GPS coordinates, not necessary the address on the road GPS location to navigate you address you are trying to get to. My work is one of the locations, our address on the road is about 1000 ft from the physical location of the building and when you do a google search it put the address location on the build. Just happen there is a road behind the build with is 500 ft away and google will take you down that road and tell you to turn into the woods to get to your locations. I have reported this error a couple of time with google and they can not seem to fix it, Waze address the issue immediately, waze only had the issue when google bought them and waze tend default to google address database verse using their own, recent waze defaulted back to their own database. I have Apple Car Play, but I have never turned it on. It requires a cable which I never have with me. The few times I've needed mapping I just used the factory built in system, for the most part I don't go anywhere - work, home, grocery store, school. All in a 5 mile radius. I can do that in my sleep. If it's Google, no F'ing thank you! I don't want that filth on any of my gear! Apple Maps has been fantastic for me these last few years, so perfectly happy with it! For the odd time I need something else, Nokia HERE for me, NO GOOGLE! I was on the beta for iOS 12, and did the update for Google Maps yesterday. Since then, every time I try to open Google Maps, it crashes. I have even deleted it and redid the download. Any thoughts on a fix? Lol, I appreciate having the right tool for the right job but so far this is the usual lackluster Google work - there's no night mode! You would think Apple would include CarPlay guidelines such as "don't blind your users with heavy white backgrounds". Satellite mode is a little better for now. Google, test your sh*T at night before launching it to the public! This is fair. My apple devices have lots of features and functions I never use. But...i can imagine a situation where I am on my way to work, home, store, school and an emergency comes up and I'd like to ask Siri for directions to the nearest ER, police station, fire station. I do agree I'd really value wireless CarPlay in my Ford on its sync 3 system. But...i can imagine a situation where I am on my way to work, home, store, school and an emergency comes up and I'd like to ask Siri for directions to the nearest ER, police station, fire station. You don't have to use Car Play to do that. You can just use your iPhone by itself. But in an emergency you are not supposed to go to the police station or the fire station. Perhaps the ER if you are close otherwise you should call 911. I used Google Maps all day yesterday and this morning as well. I will stick to using Apple Maps. 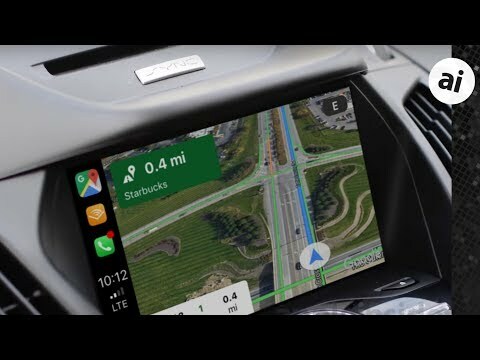 The one I'm looking forward to is Sygic with CarPlay. That should be released any day now hopefully. Why would I care? None of them is even close to Waze. Both of them resemble outdated GPS in Land Rovers. Do any of them have adaptable algorithms to traffic levels and road hazards? Waze does so do not think it will guide you the same route every time. A lot of people in LA hate that feature because Waze reroutes commuters through their quiet winding narrow streets that were not designed as shortcuts to avoid traffic. They are for neighborhood access not thoroughfare for the general public. 1) the volume would always default to a “medium”-ish volume, even when I turned it down. It would just reset itself next time the nav instructions came on. 2) speed limits are missing, despite the config option for them. I toggled it a bunch, to no avail. I like Apple Maps ... BUT I use Waze 95% of the time for the extremely useful on-road alerts (hazards, police, crashes, traffic). I also noticed that Waze recently integrated gas pricing. So ... Apple, I know you are busy inventing cool AR, self-driving cars, and other wiz bang futuristic products, but let's not lose site of the everyday technologies people rely on. If you want to be on par with Google(Waze), you NEED crowd-sourced alerts - period. While you are at it fix Siri - Your customers have only been asking for a decade now. Hire less high paying autonomous car engineers and hire a couple of interns to keep Siri up to date on responses to even the most basic questions. Example I asked Siri what time a world series baseball game was on - and it replied the team wasn't playing tonight. I asked for traffic on a local highway and it gave me traffic conditions in a different country - really it's not like it doesn't know exactly where I am. Shameful Mr. Cook. I just tried Google maps on CarPlay. My BMW has a Nav menu button. When connected to CarPlay, pressing it automatically launches Apple Maps, and it remains at Apple Maps even when I am using Google Maps..
I’ve actually had Google to steer me wrong multiple times when Apple Maps and Waves was telling me right. So, I guess experiences may vary. With Google Maps, the car play screen is ok. I wish it were easier to zoom in. As least they put your Car/Arrow about a third into the screen if it was right in the centre of the screen like in a beta I probably shouldn't mention, many of your turns are covered by the ETA indicators (time min mi/km). However, I find the turn by turn instructions that display on the iPhone screen to be too small to be any good. They seriously need to be larger.